"AFTERNOON WESTBOUND" Fine Art Print Image Size: 8.5" x 17" Paper Size: 13" x 19" Price: $99.00 FREE Shipping in Continental U.S. Insured & Shipped in sturdy Fine Art mailing tube. No exchanges, returns or refunds. In event of loss or damage in transit, Purchaser must contact Seller within 7 days of delivery for replacement of identical item. *Please allow 2 - 3 weeks from date of purchase for delivery. "AHEAD OF THE TRACKERS" Fine Art Print Image Size: 14" x 11" Paper Size: 19" x 13" Regular Price: $99.00 FREE Shipping in Continental U.S. Open Edition, Individually Hand-Signed by the Artist Insured & Shipped in sturdy Fine Art mailing tube. No exchanges, returns or refunds. In event of loss or damage in transit, Purchaser must contact Seller within 7 days of delivery for replacement of identical item. *Please allow 2 - 3 weeks from date of purchase for delivery. 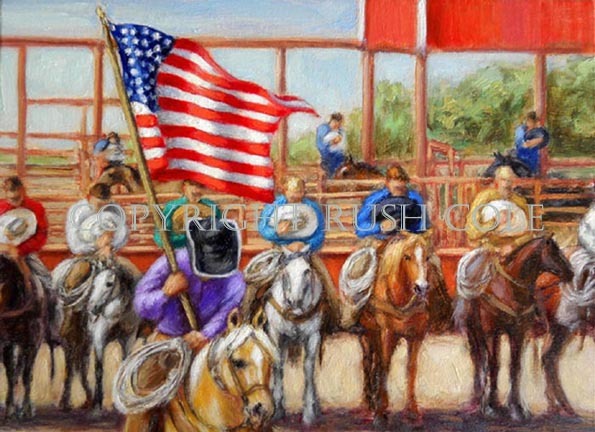 Limited Edition Giclee (CANVAS) Title: " AMERICAN RODEO: It Always Begins With A Prayer" Image Size: H :22" x W :28" x D: 1.25" Numbered & Signed, Certificate of Authenticity. Gallery-wrapped, image extends around all four sides, stretched on wooden bars, double varnished, wired for exhibit. (No extra framing necessary.) Edition: (100) Price: $955 Artist Proof: (10) Price: $1095 (Shipping costs are extra, per individual quote.) Professionally Packed, Insured, and Shipped via UPS. No exchanges, returns, or refunds. In event of loss or damage in transit, Purchaser must contact Seller within 7 days of scheduled delivery for replacement of identical item. *Please allow 3 -4 weeks from date of purchase for delivery. Limited Edition Giclee (PAPER) Title: "AMERICAN RODEO: It Always Begins With A Prayer" Image Size: 11" x 14" Paper Size: 13" x 19" Edition: (650) Price: $198 Artist Proof (65) $235 *Certificate Of Authenticity. Packed, Insured and Shipped in sturdy Fine Art Mailing Tube. No exchanges, returns or refunds. In event of loss or damage in transit, Purchaser must contact Seller within 7 days of delivery for replacement of identical item. *Please allow 3 -4 weeks from date of purchase for delivery. "AN AFFAIR TO REMEMBER" Fine Art Print Image Size: 14.5" x 11" Paper Size: 19" x 13" Price: $99.00 FREE Shipping in Continental U.S. Open Edition, Individually Hand-Signed by the Artist Insured & Shipped in sturdy Fine Art mailing tube. No exchanges, returns or refunds. In event of loss or damage in transit, Purchaser must contact Seller within 7 days of delivery for replacement of identical item. *Please allow 2 - 3 weeks from date of purchase for delivery.